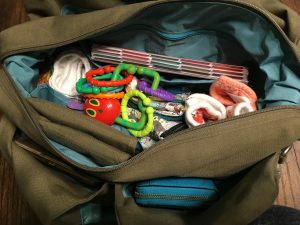 The diaper bag scene has changed in the past eight years. 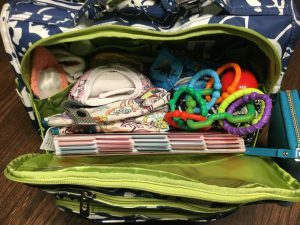 When I first found out that I was pregnant I knew that I was willing to splurge on a good diaper bag. With A, I had gone through about 10 in the first 2.5 years of her life. At $25 a pop, that was $250. Meanwhile, with E, I spent $125 and received a Skip Hop bag that was ideal for 2 kids even with cloth diapers for E and all of the things you need for a 3 year old who has just been potty trained. The best part was that it had a tiny mommy bag that snapped and unsnapped. 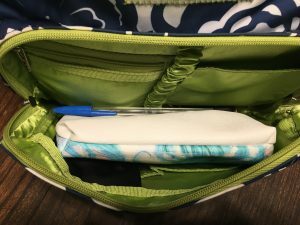 With credit card slots, a zipper purse and space for a lipstick, it had everything I needed for a clutch purse! You know, for those rare moments I was caught without a kid. So, I started at Skip Hop and found that my perfect bag was no longer available. I searched and searched for about 7 months and finally ended up with a Lassig Neckline Bag. It was stylish, functional and I really enjoyed the space. When I went on my first plane ride with C, I found out that this was not as perfect when traveling. It just wasn’t enough space for all of the things that I needed. I ended up looking for another option this summer to make a few planned trips easier. I got a great deal on a Little Unicorn Manifest Weekender. Holy room BatMan, my Lassig literally fits inside this bag! The problem, after two flights, is that this bag has uncomfortable straps. No matter how little or much is in it, those shoulder straps dig. works well as a backup bag for car rides or as a weekend away (for one) bag, though. A few weeks ago, I found a JuJuBe BFF on the marketplace. 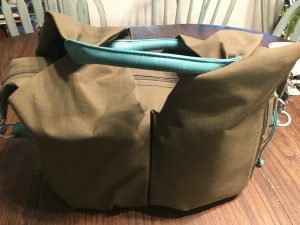 JuJuBe is apparently the diamond of the diaper bag world and for less than $50 I decided to test it out. I totally understand why so many women LOVE the BFF. If I wasn’t running a business, the lives of 4 people in addition to me and trying to cloth diaper (and now feeding a baby solids) I might be in love too. 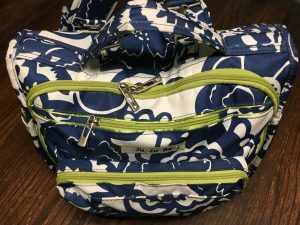 On days that I don’t pop my day planner and iPad in, this really is the perfect diaper bag… even if I don’t love the floral print I have (and there is some fraying along the edges so I can’t say it will last as long as we diaper). All this bag has really done is make me more curious about the JuJuBe BRB, specifically for traveling and very long days out. I thought I’d do a comparison of the bags all packed with the same thing. Because honestly, this is what I wished I could have had while pregnant. I want to see the exact same stuff packed inside each back so that I can have a clear idea of how it all works. Go ahead, share this with all of your momma friends – they will thank you. These are my ideal items to pack comfortably in a bag. cloth wipes in a wet bag. Yes, I know I pack a lot. However, I often have multiple appointments a day with no guarantee that I will be getting back home for extra diapers and wipes, or to work. On those days, I need the extra diaper and my iPad to log in and work remotely. The planner isn’t completely necessary but I like to have it because then I keep all my thoughts in one spot. – just me. 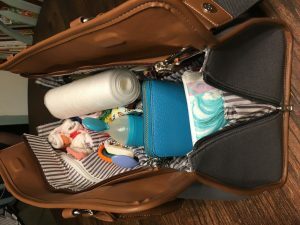 This bag holds everything and if you babywear (which I do quite a bit) it is super easy to use with a front carry. 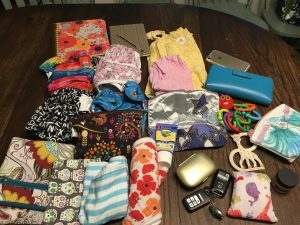 Fully packed, it’s a bit overfilled, though and I wish the mommy pocket was a bit bigger because my wallet just sits on top of the diaper space. I love the bottle pockets on the side. This bag holds everything! I love the extra pockets on the outside because there is a space for everything. The problem is that in the main section of the bag things get jumbled. 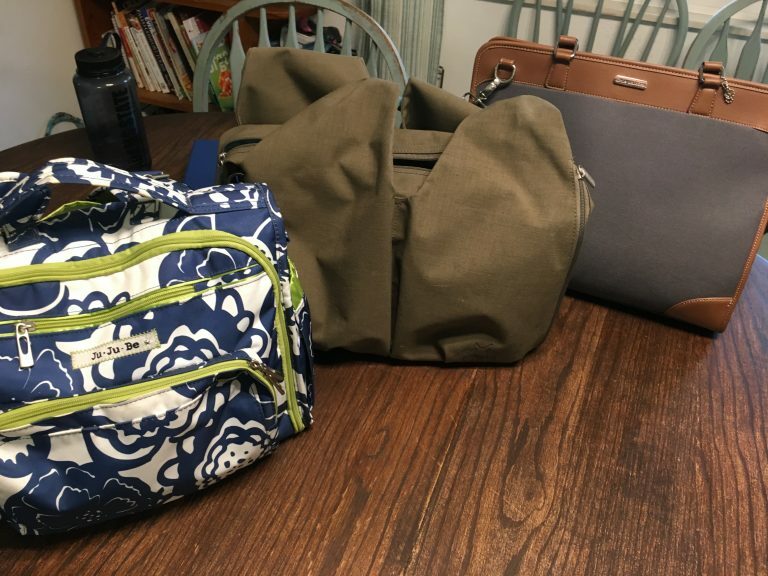 (Disclosure – this first picture includes the extra items for packing for travel. It’s not much, but it is there.) Best feature is the side zippers so that you can get into all of the base space. However, the top zipper broke the first weekend I used it. So, I’m measuring this on a 1-3 score to try to make this easy. One is the best and 3 is the worst. The Lassig and BFF are neck and neck. I could probably fit more diapers in the Lassig than I could in the BFF, but the straps are not as comfortable when on a walk, at the park or going around all day. It also does not stay as well organized. Where the Lassig beats the BFF is the outer pockets. That bag is fantastic for my wallet to fit in one pocket, a second built in wet bag, pen holders, the list goes on. But, it is bulkier for what I have in it and doesn’t fit as well under the seat of an airplane. So for me, right now, the winner is the BFF (as I longingly look at my Lassig because I love it more). I have a friend loaning me a BRB and I’m silently hoping that this will end my Diaper Bag quandry. 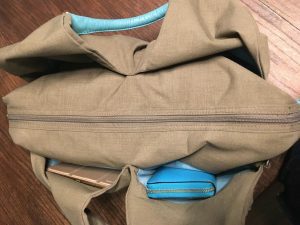 What diaper bag do you have and LOVE? OMG! We’re obsessed with JuJuBe!!!! I go between the BRB and the Be Classy! I’ve used the BFF but just couldn’t get it to work for our lifestyle when M was younger! Now that she’s toddler like and requires less things it would probably be a well fit but when we cloth diapered and I’m an over packer it just didn’t work! The one thing I wish the BRB had was gussets so it didn’t spill open when fully unzipped! I know several of the mamas that have them have added them in though! 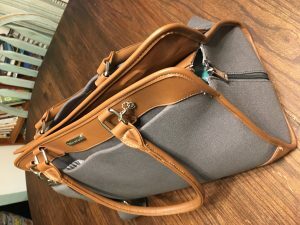 The Be Classy I love because it’s more structured and classic looking rather than screaming diaper bag to me!